"The Church which 'goes forth' is a community of missionary disciples who take the first step, who are involved and supportive, who bear fruit and rejoice. An evangelizing community knows that the Lord has taken the initiative, he has loved us first (cf. 1 Jn 4:19), and therefore we can move forward, boldly take the initiative, go out to others, seek those who have fallen away, stand at the crossroads and welcome the outcast. Such a community has an endless desire to show mercy, the fruit of its own experience of the power of the Father’s infinite mercy. Let us try a little harder to take the first step and to become involved. Jesus washed the feet of his disciples. The Lord gets involved and he involves his own, as he kneels to wash their feet. He tells his disciples: “You will be blessed if you do this” (Jn 13:17). An evangelizing community gets involved by word and deed in people’s daily lives; it bridges distances, it is willing to abase itself if necessary, and it embraces human life, touching the suffering flesh of Christ in others. Evangelizers thus take on the “smell of the sheep” and the sheep are willing to hear their voice. An evangelizing community is also supportive, standing by people at every step of the way, no matter how difficult or lengthy this may prove to be. It is familiar with patient expectation and apostolic endurance. Evangelization consists mostly of patience and disregard for constraints of time. Faithful to the Lord’s gift, it also bears fruit. An evangelizing community is always concerned with fruit, because the Lord wants her to be fruitful. It cares for the grain and does not grow impatient at the weeds. The sower, when he sees weeds sprouting among the grain does not grumble or overreact. He or she finds a way to let the word take flesh in a particular situation and bear fruits of new life, however imperfect or incomplete these may appear. The disciple is ready to put his or her whole life on the line, even to accepting martyrdom, in bearing witness to Jesus Christ, yet the goal is not to make enemies but to see God’s word accepted and its capacity for liberation and renewal revealed. Finally an evangelizing community is filled with joy; it knows how to rejoice always. 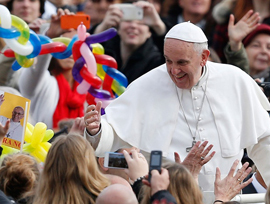 It celebrates every small victory, every step forward in the work of evangelization. 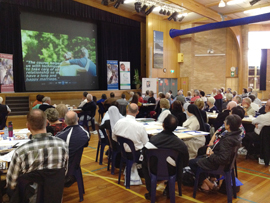 The Autumn edition of Journey Magazine featured a report on the recent Diocesan Assembly held on Saturday 1 March in Wollongong. The day focused upon how all of us can work more closely and collaboratively in sharing the ‘Joy of the Gospel." The Our next Diocesan assembly will be held at Mount Carmel Catholic High School Hall, Varroville on the 6 September. This workshop, aimed at those involved in initiating people into our faith community, will focus on the Marriage Annulment process and its implications for Christian Initiation. how best to broach the subject of marriage annulments as a potential requirement before Christian Initiation into the Catholic Church can take place. The workshop will be of value to all those involved in the RCIA and Sacramental preparation ministries. Over the Sundays of this year we will be listening to Matthew’s Gospel. Like each of the gospels, Matthew presents Jesus in his own unique way. Jesus is the one who fulfills ‘the law and the prophets’, he is the Messiah of Israel, the king and saviour of the world. He comes before us as the teacher & lawgiver, greater even than Moses. And of course he is presented as the son of man giving his life for us all. Over the course of 2014 Darren McDowell will be offering a series of stand-alone sessions exploring the rich themes found in this gospel. If you would like to attend the Mass and/or luncheon, for catering and accommodation purposes, could you please send your acceptance via telephone or email. How do I experience my own spirituality? What gives me meaning and purpose in my life? These are some of the questions we will explore together in this spirituality workshop. Cost by donation and lunch is provided. What is Lay Pastoral Ministry and how can it help parish life? As part of our Parishes Working Together process, the Diocese is hosting a dynamic workshop especially for clergy, pastoral councils and ministry coordinators involved in supporting and coordinating volunteers within the parish environment. All welcome. 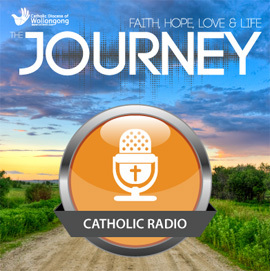 Have you heard The Journey - Catholic Radio Show yet? The Journey is a weekly program produced by the Diocese of Wollongong. This week features an in-depth interview with Bruce Downes, The Catholic Guy, as well as all the regular weekly spots including our Sunday Gospel Reflection, Sr Hilda’s wisdom from Jamberoo Abbey, great tips for living well from Trish McCarthy and Pete Gilmore and Fran, and Byron Pirola on marriages.